The Stroke Association has developed a number of resources relating to stroke in childhood through its Childhood Stroke Support Service. Some of these are aimed at parents and carers, whilst some are suitable for children, brothers, sisters and friends. Many of these resources will also be of interest to professionals supporting families affected by stroke in childhood. Our childhood stroke handbook explains to children what happens when they have a stroke, and also has advice for parents. We have developed four videos to illustrate the content of the childhood stroke handbook - thanks to the support of the Childwick Trust. Watch our video 'what is a stroke' below, and find more videos on 'what happens when you have a stroke', 'getting better after having a stroke' and 'talking about having a stroke' in the Childhood Stroke Playlist on our YouTube channel. 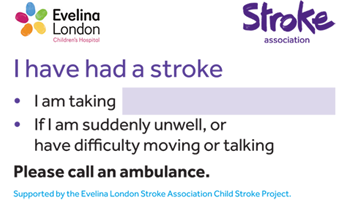 We've also developed a small medical information card (shown below) for use by childhood stroke survivors. If you'd like a free copy, please contact anna.panton@stroke.org.uk or you can download your copy now. Our childhood stroke guide provides information about the causes of stroke in children, the treatments, and coping with life after childhood stroke. We've also developed a childhood stroke handbook, which explains to children what happens when they have a stroke and also has advice for parents. Find more videos on what happens when you have a stroke, getting better after having a stroke and talking about having a stroke in the Childhood Stroke Playlist on our YouTube channel. Questions to ask when your child starts or returns to school. Questions to ask at neurology appointments. Questions to ask when looking for therapy services or attending therapy appointments. You'll find additional links to organisations below, who can offer further support and information related to childhood stroke. Hemihelp – provides information and support to children and families affected by weakness on one side of the body. They have activity and support groups for parents and siblings and give advice on aids and equipment. Brain Injury Hub – a website providing in-depth information on childhood brain injuries (including stroke). Child Brain Injury Trust – an organisation that supports children, young people and families affected by acquired brain injury. Provides information, advice lines, local services and events. Cerebra – an organisation that supports children, young people and families affected by neurological conditions. Provides information, resources and services. Has an Innovation Centre which will customise equipment for children with disabilities. CHASA – an American site providing a range of information and resources on stroke in childhood and hemiplegia. International Alliance for Pediatric Stroke – an international site drawing together a range of information and resources on stroke in childhood. CPSSA – a Canadian site providing a range of information and resources on stroke in childhood. Calgary Pediatric Stroke Program – a Canadian site addressing some of the frequently asked questions about stroke in babies/around the time of birth. Different Strokes – an organisation that supports younger people affected by stroke, and has a resource page for stroke survivors from 13-25. Strokidz – an Australian site providing a range of information and resources on stroke in childhood. Contact – an organisation that supports the families of children with disabilities. Provides a range of services and information. Scope – an organisation that supports the families of children with disabilities. Provides a range of services and information. Young Sibs – an organisation that supports the siblings of children with disabilities. Provides information, resources and a chat room. IAS Services – offers information, advice and support for disabled children, young people, parents, and those with special educational needs. You can check here if there is a service in your area. IPSEA – an organisation that offers legal advice, support, and training for parents around Special Educational Needs. Council for Disabled Children – a national umbrella body that brings together a diverse range of organisations that work with and for disabled children to support the development and implementation of policy and practice. SOS!SEN - an organisation that offers information and advice on special educational needs and disability through a national helpline and local walk-in SEN advice centres. Statutory guidance on supporting children at school with medical conditions – includes examples of care plans. The Stroke Association provides information on benefits and financial assistance and offers Life After Stroke Grants. Cerebra offer a specific guide to applying for DLA, and Contact offers a benefits check via their helpline. Sickle Cell and Young Stroke Survivors and Sickle Cell Society – organisations that offer information and support to children, young people and families affected by stroke and sickle cell disease in childhood. Epilepsy Action and Young Epilepsy – organisations that provide tailored information about epilepsy for children and young people. Cardiac risk in the young and the British Heart Foundation – organisations that provide tailored information about heart conditions in children and young people. The International Alliance for Pediatric Stroke has a range of resources and publications about childhood stroke. A Stroke Can Happen at Any Age by the International Alliance for Pediatric Stroke is a video to raise awareness that stroke happens to infants, children and even before birth. Young stroke survivor, Oli, talks about getting back to life after stroke. Lily-Mae had a stroke at the age of 7. Here Lily-Mae's parents speak of their personal experience and give an account of the problems parents face when dealing with childhood stroke. My Way by Hemihelp is an uplifting collection of home-made clips filmed by families and people affected by hemiplegia (weakness down one side of the body, that can sometimes be a consequence of stroke). The aim is to tell the world that hemiplegia doesn't mean living half a life. If we face a challenge then we just find our own way around it.